Although I’ve already mentioned this before, you guys, the only ones who received the letter written by the best group DJ; Eunhyuk, its good to take that sense of responsibility away. Eunhyuk DJ really has to leave temporarily, to me, it’s a night whereby I have many things to say to everyone. Everyone, everyone will probably feel the same while listening to me reading out my letter, it doesn’t matter if you guys got a shock; it’s written just like this. In these 5 years, during this period of time, doing things while sitting in this position, spending every night together with all of you, it felt really blissful. Me, having to leave this position for a couple of months, it’s not a permanent farewell. Just like this, let’s continue to stay together. Although it’s a temporary farewell, today’s leaving is my most selfish decision in my whole life, it’s a decision made due to my job, please respect it. And Leeteuk-shi, when introducing songs using English, don’t always push it to Yesung, you read some yourself too. When I’m not around, don’t randomly take pictures with female guests. Also, talk about topics regarding me often, and Yesung-shi, you did really well during this period of time to have come to this position, do according to what our listeners say, they really like adorable things, adorable actions, acting cute, it’s tired doing all these but please show these to them often. And Leeteuk-shi, don’t be too hurt or feel inferior when there’s no reactions to your jokes, you’re a meek person. So I only have all these requests, and please, really have to talk about topics regarding me during Sukira. Ah really, now I’m left with less than 3 minutes of time. I’ll say a bit more now. My first Sukira DJ broadcast was 2006 August 21th, really.. Actually I really didn’t think that I could be a DJ, I’m not good at words, wasn’t active at that point of time too. People who allowed me in becoming a DJ, really very thankful, in these 5 years, the ones who always listen to my voice every night at 10pm, really very thankful to everyone. I really won’t cry today, because I’ll be back. Because I’ll be back after 3 months or so, thus I’ll not let everyone notice my tears. Really. I should be smiling actually, and when I’m in China, everyone must show me and the other SJ-M members more support, I’ll always miss Sukira. And having the thought of Leeteuk-hyung and Yesung-hyung who are sitting here in these positions in me, I’ll work hard in activities. Super Junior’s Japan concert on-site has been released. On the 26th broadcast of KBS 2 TV , Super Junior’s Asia tour concert in Japan was disclosed, capturing attention. Meanwhile, Super Junior’s concert was unveiled on this day, Japan’s fans at the venue learned and sang along to Korean songs and wore caps bearing their national flags, resulting in attention focused on them. MANILA, Philippines – Korean boy band Super Junior lived up to its promise and hype as its members delivered another successful concert for Filipino fans last Feb. 26 at the jampacked Araneta Coliseum in Quezon City. Super Junior’s “Super Show 3: The 3rd Asia Tour” Manila leg was nothing short of spectacular, from the massive stage and giant screens to the wonderful numbers performed by the boy band fangirls and fanboys screamed and cheered, waved their banners, and sang with Super Junior, holding aloft their light sticks that turned the coliseum into a sea of sapphire blue. The Super Junior members who performed at the Araneta Coliseum were Leeteuk, Heechul, Sungmin, Siwon, Donghae, Yesung, Eunhyuk, Kyuhyun, Shindong, Ryeowook, and Henry Lau (member of sub-unit Super Junior-M). Special guest was SM Entertainment’s artist, TRAX. The concert opened with Donghae being lifted up from the stage by cables. As both the band and the fans reeled happily from the concert, Super Junior-M member Henry Lau gave a shout-out to the Filipino fans who watched the show. “Had a blast in the Philippines! You were all AWESOME! Thank you so much! Hope to be back soon!” he tweeted after the concert. Heechul also tweeted to thank the Philippines. “Manila! Feel so good! I really love u! My body didn’t feel good but Philippines’ cheers made me feel better,” he posted on Twitter. Bulletin Entertainment asked Filipino fans to share their Super Show 3 experience and they were one in saying that the concert was awesome, unforgettable and exciting. Edna Marie Vilchez and 10 of her friends flew all the way from Bacolod just to watch the Super Junior concert. She said she was lucky that she saw Super Junior in person. “It was totally indescribable for me. I was shouting most of the time at the concert, as in, from start to end. They were so perfect! We waited for almost 10 hours outside Araneta but it was so worth it!” she said. Super Junior made sure that fans were not only able to watch them sing but get up close and personal as well. Members interacted with fans, and leader Leeteuk gave a shirt to a lucky female fan. For Dannca Francisco, 13, from San Pedro, Laguna, it was her first time to watch a Super Junior concert. “I felt very excited and nervous at the same time before the concert. But in the end I felt very happy,” she said, adding that it felt great seeing Super Junior in person. Another fan, 18-year-old Judith Sabojocan of Muntinlupa City, said she loved every minute of the concert. 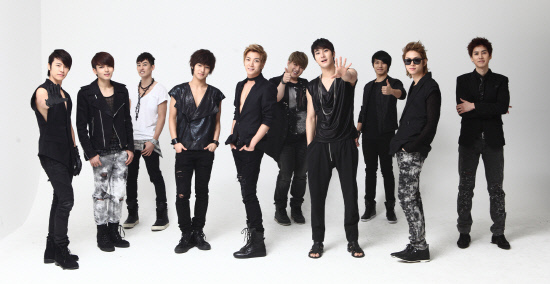 “Seeing Super Junior again, especially more closer now, was like what Sungmin and Leeteuk did! I felt like I was the one flying on air! I loved every minute of the show but the tribute for Kangin was amazing! Yesung and Ryeowook made my Saturday night like Valentine’s Day! I love ’em all!” she told Bulletin Entertainment. There were funny moments, too, notably Heechul impersonating Lady Gaga together with Donghae, Eunhyuk and Shindong, who all came out dressed as ladies. Siwon also did fans a service by performing a number shirtless, showing his well-sculpted body to the delight of the audience. Fans also noted the highlights and memorable scenes at the concert. For Marquez, whose favorites are Kangin and Kyuhyun, “My favorite would be the part where Heechul went to our side and got the Kangin mask from me. He used it during his solo and gave it back to me. I was really touched. I actually cried,” she said. Super Junior member Kangin is currently serving in the military and was unable to join the Manila concert. “It was so great hearing all the fans sing with them, especially since the song was in English. The Lady Gaga and Beyonce numbers by Heechul (as Lady Hee Hee) and Donghae, Eunhyuk and Shindong were fabulous,” she said. Francisco, who is a huge fan of Donghae, said her favorite moment was the “Rinaldo” song. “It was when all ELFs cried because we miss Kangin and also when Henry said Philippines is the loudest [crowd],” she said. The Super Show 3 is already over but fans are still talking about the great concert experience. A day after the concert, Super Show 3 in Manila was still a trending topic on Twitter. In fact, fans are already talking about Super Junior’s Super Show 4 next year. Super Junior had a great impression of the Philippines based on the cheers and support of the thousands of fans who filled Araneta Coliseum. For the fans, Super Junior will always be No. 1 in their hearts. Popular idol group Super Junior recently held a film screening for their concert film, ‘Super Show 3 in 3D‘. On February 23rd, Leeteuk, Yesung, and Shindong dropped in for the event and watched the concert film with their fans in a CGV theater in Seoul. Before the screening, leader Leeteuk showed his enthusiasm for the film by saying “It’s very cool how you can feel the sensation that you could usually only experience in concerts. I hope many viewers come and enjoy our ‘Super Show’“. Yesung commented, “It’s my first appearance in a movie after ‘The Attack of the Pin-Up Boys“, so this reminds me of old memories“. Shindong made the audience laugh by glibly expressing, “I’m looking forward to seeing myself in 3D. I might pop right out so don’t get too surprised!“. During the screening, fans enjoyed Super Junior’s ‘concert’ by wearing 3D glasses and energetically waving blue lightsticks. Reportedly, the film was enough to feel like they were in the crackling atmosphere of a concert, and they enjoyed the big fun-filled variety concert. Starting on February 24th, ‘Super Show 3D’ will be shown in all CGV theaters, allowing the fans who’ve missed the concert to catch the event. Hot responses are also expected from those fans who want to experience a different element to the concert. The film captured Super Junior’s concert in the Seoul Olympic Park Gymnasium from last August. SM Entertainment is expected to create and produce more 3D contents in the future, so stay tuned for more updates! The boys of Super Junior have transformed into smouldering immortals for a new CF with 12plus Cologne’s newest scent, ”Twilight“. 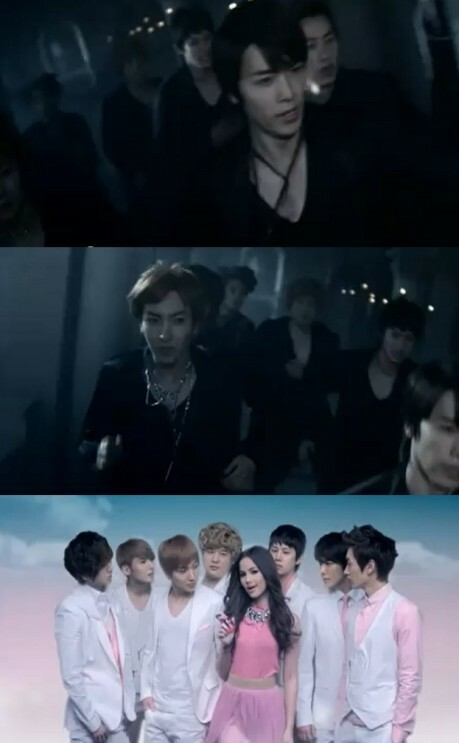 In the CF, the boys are seen chasing after a Thai actress, who plays an irresistible vampire. She seduces Super Junior with her vixen-like looks and her (presumably) alluring scent. Eventually, they too are turned into beautiful, yet hungry vampires. Packaged in pink girly vials, “Twilight” is sure to be a hot product for many fangirls in Thailand. Check out the 30-second promo below! Super Junior has once again proven their clout as one of Korea’s top Hallyu groups, as it was revealed that their fourth album, “Bonamana“, maintained its #1 position on Taiwan’s biggest online music site, KKBOX, for an astounding 38 weeks!